Tumor senescence and radioresistant tumor-initiating cells (TICs): let sleeping dogs lie! Preclinical data from cell lines and experimental tumors support the concept that breast cancer-derived tumor-initiating cells (TICs) are relatively resistant to ionizing radiation and chemotherapy. This could be a major determinant of tumor recurrence following treatment. Increased clonogenic survival is observed in CD24-/low/CD44+ TICs derived from mammosphere cultures and is associated with (a) reduced production of reactive oxygen species, (b) attenuated activation of γH2AX and CHK2-p53 DNA damage signaling pathways, (c) reduced propensity for ionizing radiation-induced apoptosis, and (d) altered DNA double-strand or DNA single-strand break repair. However, recent data have shed further light on TIC radioresistance as irradiated TICs are resistant to tumor cell senescence following DNA damage. Taken together, the cumulative data support a model in which DNA damage signaling and repair pathways are altered in TICs and lead to an altered mode of cell death with unique consequences for long-term clonogen survival. The study of TIC senescence lays the foundation for future experiments in isogenic models designed to directly test the capacity for senescence and local control (that is, not solely local regression) and spontaneous metastases following treatment in vivo. The study also supports the targeting of tumor cell senescence pathways to increase TIC clonogen kill if the targeting also maintains the therapeutic ratio. In the previous issue of Breast Cancer Research, Karimi-Busheri and colleagues  shed further light on the relative resistance in breast cancer-derived tumor-initiating cells (TICs) by interrogating DNA damage signaling and repair and the capacity for tumor cell senescence in CD24-/low/CD44+ cells derived from MCF-7 mammospheres. Primary or adjuvant breast radiotherapy is an important component in multimodality therapy as a means to improve locoregional control and potentially improve overall survival [2, 3]. Understanding the biology underlying the relative radiosensitivity of breast tumor clonogens is an important step in personalized medicine to effectively predict clinical response and develop novel targeted therapies. 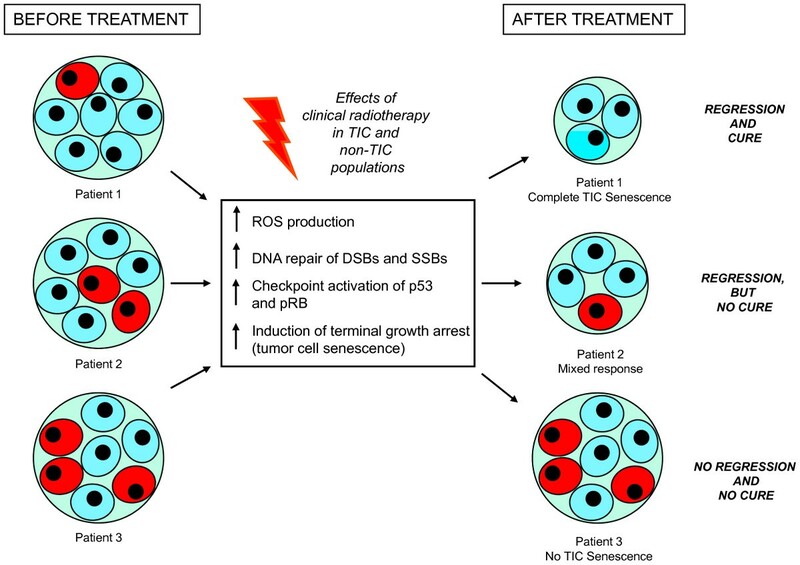 In this context, Karimi-Busheri and colleagues  add to the increasing literature using established cell lines and primary tumor explants on TIC resistance as the basis of treatment failure following radiotherapy and chemotherapy treatments [4–9]. Like previous investigators, the authors show that when compared with non-TIC monolayer cultures, TIC mammosphere clonogens have a decreased production of reactive oxygen species following ionizing radiation (IR)  and bypass the ATM/DNA-PKcs-dependent phosphorylation of the histone H2AX in response to IR-induced DNA double-strand breaks (DSBs) . Despite the bypass of the γH2AX response, TICs acquire hyperphosphorylation of downstream signaling proteins such as p53, RB, and CHK2, a finding initially reported in glioma TIC studies . As other investigators have reported, activation of AKT and canonical WNT signaling pathways within breast cancer TIC subpopulations has resulted in increased efficiency of DNA repair [5, 6]. However, an increased capacity for DSB repair is not a universal finding in all TIC subpopulations  and may be dependent on the cell model, culture conditions, and different DSB assays. When a number of assays were used, DSB repair in TICs was unaffected in the study by Karimi-Busheri and colleagues . However, the authors observed an increased capacity for the repair of DNA single-strand breaks (SSBs) associated with an increased expression of the APE1 protein. However, we do not know whether this is causal as SSB repair data using APE1-isogenic systems were not presented. Where the authors truly advance the field is in their mechanistic studies of the mode of cell death in irradiated TICs versus non-TICs. Although breast cancer TICs can express high levels of antiapoptotic proteins, such as survivin or the BAX/BCL-2 family , the authors did not observe TIC resistance to IR-induced apoptosis. Instead, they observed that irradiated TICs have reduced tumor cell senescence associated with increased telomerase activity and increased expression of the senescence-associated proteins, including ING1, p21WAF, and SA-β galactosidase. These results echo recent data in which fractionated IR led to a relative increase in the fraction of senescent cells in vitro in breast cancer non-TICs versus TICs . The reader is left wondering how DSB repair can be normal in TICs when the ATMser1981, γH2AX, p53Ser15, and pRB responses are abnormal. Future experiments therefore are required to study the upstream activation of the MRE11-RAD50-NBS1 (MRN) complexes, altered chromatin states in TICs before and after IR, and the relative control and activation of telomerase activity in TICs . Nonetheless, the cumulative data support a model in which DNA damage signaling and repair pathways are altered in TICs and lead to altered modes of cell death with unique consequences for long-term clonogen survival . However, extrapolating these data from in vitro studies directly to the relative radiocurability or chemosensitivity in vivo among individual patients in the clinic is not straightforward. If TICs are relatively resistant and determine the overall curability of a given tumor, to what extent do TIC number and radiosensitivity vary from patient to patient? Does this explain why one patient is cured and another has an initial regression only to undergo subsequent local or systemic recurrence (Figure 1)? From quantitative preclinical studies using syngeneic murine tumors or human xenografts, we know that the proportion and radiosensitivity of TICs can be measured and reflect radiocurability in vivo [14, 15]. Yet this relationship may be further complicated by intra-tumor heterogeneity in which hypoxia subregions can provide a niche for TIC survival, aggressiveness, and increased metastatic capacity [16, 17]. Indeed, it is still unclear whether local radioresistance equates directly with an increased capacity for systemic metastases [18, 19]. At present, one cannot translate a differential capacity for DNA damage response and tumor cell senescence in TICs to a globally resistant tumor cell phenotype. But the data on TIC senescence lay the foundation for future experiments in isogenic models designed to directly test the capacity for senescence and local control (that is, not solely local regression) and spontaneous metastases following treatment in vivo . Model of tumor cell senescence in breast cancer tumor-initiating cells (TICs) as a determinant of radiocurability. The failure of ionizing radiation to initiate tumor cell senescence in CD24-/low/CD44+ MCF-7 TICs (derived from mammosphere culture) leads to relative radioresistance over non-TIC monolayer cells (TIC = red circle; non-TIC = blue circle). Resistant TICs have attenuated or abnormal reactive oxygen species (ROS) production, abnormal DNA damage signaling and checkpoint control, and an altered propensity for ionizing radiation-induced tumor cell senescence. The number and sensitivity of TIC populations could vary from patient to patient and reflect individual patient radiocurability within clinical cohorts. On the left are examples of patient-specific scenarios in which the initial fraction of TICs is varied prior to potentially curative fractionated radiotherapy. On the right are scenarios that represent radiotherapy cure or failure. Sterilizing all TIC clonogens and killing non-TICs via tumor cell senescence in patient 1 lead to both tumor regression and local control (for example, tumor cure). The failure to activate tumor senescence and kill any TIC or non-TIC leads to a complete lack of response and local failure in patient 3. Patient 2 shows a mixed response in which non-TIC populations are killed, leading to initial tumor regression, but owing to the re-growth of TIC clonogens, the patient ultimately fails therapy. Future research will require exquisite biomarkers to delineate the fraction of TICs within pretreatment tumor biopsies as means to predict radiotherapy response in the context of personalized medicine. Concepts shown are based on the work of Karimi-Busheri and colleagues . DSB, DNA double-strand break; SSB, DNA single-strand break. The hope for personalized medicine is predicated on understanding the unique biology within and between tumors and applying this knowledge to offer the best treatment using radiotherapy, chemotherapy, or novel molecular-targeted agents . Drilling down into the biology of rare TIC populations within clinical biopsies or tissues derived from solid tumors requires a level of sophistication that is currently lacking for the development and validation of single-cell TIC senescence biomarkers in vivo . However, targeting tumor cell senescence pathways could increase TIC clonogen kill if this approach maintains the therapeutic ratio whereby cell kill in tumors is increased when compared with cell kill in normal tissues [9, 13, 21]. Such a strategy would drive the therapeutic concept of 'let sleeping dogs lie' or, in this case, 'die'.